I love books that remind me exactly what it felt like to be a teenager. And books where guys and girls have relationships that aren’t about the luuuurve. And books that have so much real-life drama that they don’t need magic and vampires and the end of the world (although I love those too). Most of all, I love books that are sweet and funny and then kick you in the gut with totally poignant lines. 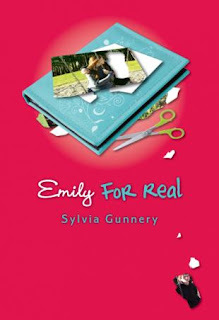 Emily For Real is all of those books at once. “Acts of Courage made me want to go dig up more information, which is surely a goal of history writers everywhere – to inspire interest in what really happened. In that sense, a rousing success! This is a beautiful book. I don’t mean the story, but the package. Congrats to the design department at Pajama Press: I was so busy admiring the fonts and running my fingers over the jacket that I almost forgot to read the book. But I’m glad I did. …Casey, full of faith and confidence. Stephanie, who annoyed me so much I caught myself thinking that Casey would have been totally justified in killing her. The teacher, Miss Burke, whose courage had me in tears. Jess’s mother, paralyzed by her own helplessness. And complex, conflicted Jess, who wants something she can’t even identify, and resents Casey almost as much as she loves her. Jess isn’t admirable, but she’s totally compelling. These people are worth your time.